The wisest of all mollusks. Famed for their abilities to deceive and for their skills in map-reading. 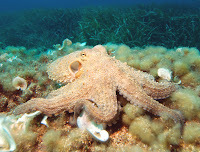 Always treat an octopus with a mixture of respect, fear, indifference, and loathing.